It is okay to stand in No Man’s Land in doubles! Players have been conditioned to stand all the way back or all the way up in doubles. While this is applicable in matches where players are skilled in placing the ball deep or hard, players who are challenged with mobility or power are wise to adjust their court position. Stand in No Man’s Land! After serving, move up, set your ready position in your half of the court in No Man’s Land, and play from there as if this were your baseline. The same goes for receiving the serve. The biggest advantage of this position is that you will get to short balls. You are shortening the court and the area you are covering. The traditional reason for avoiding playing in No Man’s Land is that your opponent may easily play shots to your feet, thus forcing you to make a difficult shot … no problem if they cannot do this consistently. Consider focusing on some doubles specialty shots from this zone that are always useful in typical positioning as well. A half volley or pickup shortening your backswing and staying low is easily perfected. The deep volley that would drop in if you let it go will take you to the net if that is where you want to go or return to your No Man’s Land ready position if you prefer to stay back. These volleys are not intended as winners, rather, only positional shots. You also will be able to easily judge “out” balls from here, which occur frequently with your opponent’s deep choices being squeezed out of the equation. While the two shots above are on the defensive side of your tactics, you will add offensive weapons to your arsenal like the drop shot when the ball bounces conveniently below the level of the net in front of you. An absolute necessity for all doubles players, a timely, well-executed drop shot confuses your opponent while putting them on the run. You will be presented with transitional short balls with a higher trajectory on occasion. Move in and hit down on these balls with more pace for a clean winner. Notice the winning shots described above are predicated by the height of the ball with low balls being dropped and high balls being hit harder. Depending on your opponent’s position, you may experiment with lobs from this zone that require a bit more finesse as well as drop volleys. 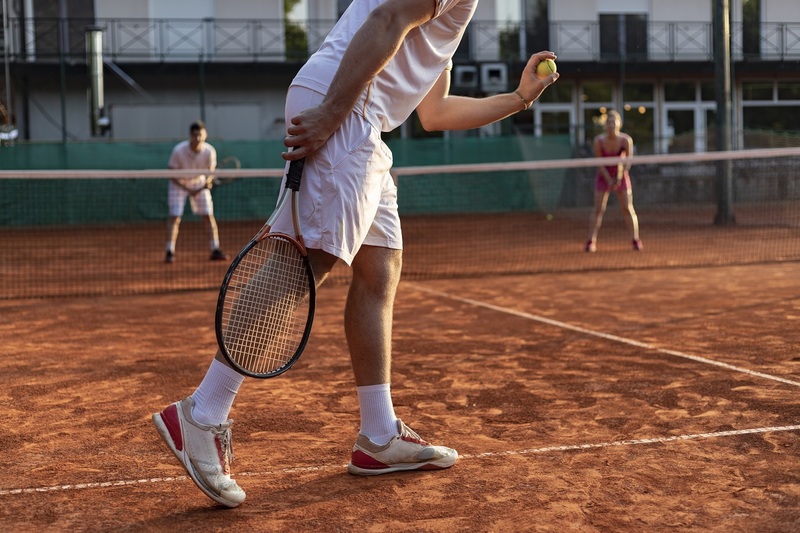 As mentioned earlier, it will be your choice to adjust your position and move in if you are eager to volley or back up a step if you prefer to let the occasional deep ball bounce. I encourage you to discuss the No Man’s Land positional option with your tennis professional to explore the feasibility of playing there on a regular basis or as an addition to your game. Mike Puc has been the Director of Tennis at Gleneagles Country Club in Delray Beach, Fla. since 1998. A winner of 15 national titles and an ATP world ranking, Mike directs 25 teams with 350 players in nine leagues, while offering the most extensive Calendar of Events in South Florida that includes tournaments, lectures and social round-robins.